Feed My Starving Children can send a speaker to share the FMSC story at your event, meeting, fundraiser, classroom or other group gathering. Our Speakers Bureau is a group of staff and trained volunteers who share the same passion—advocating on behalf of starving children around the world. At this time we have speakers available in Arizona, Illinois, Minnesota and Texas. Please fill out and submit the form below if you are interested in having an FMSC representative speak to your group. **Please make your request at least two weeks prior to your event to allow us time to locate an appropriate speaker. We will do our best to meet your need. However, please note, because our speakers are volunteers, we cannot guarantee that all speaker requests will be filled. How did you hear about Feed My Starving Children? Questions? 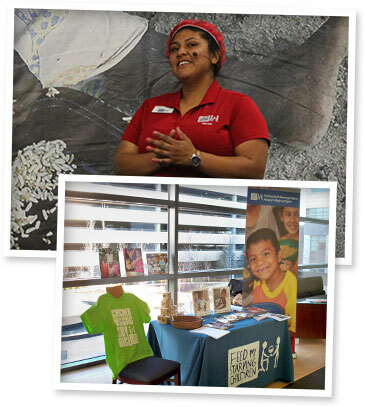 Email us at speakers@fmsc.org.